students perceived the work of artists. 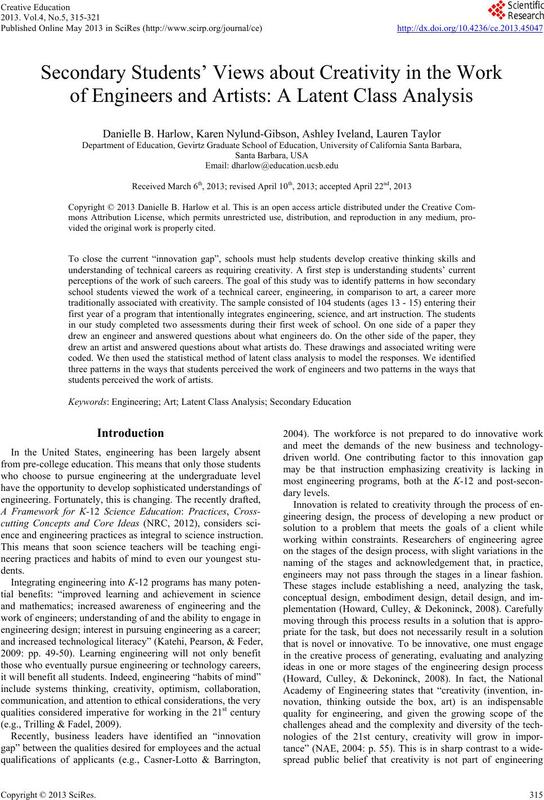 ence and engineering practices as integral to science instruction. (e.g., Trilli ng & Fadel, 2009). engineers may not pass through the stages in a linear fashion. D. B. HARLOW ET AL. (Kazerounian & Foley, 2007; Schmidt, 2011). prove science learning at al l a ges. better understand the patterns in the d at a.
terns related t o each other? and the qualitative and quantitative data analysis process. wrote a brief description of what was going on in the drawing. ments (inputs) for the work, and details about who did the work. the number of “male” drawings for both artists and engineers. round were discussed until consensus. 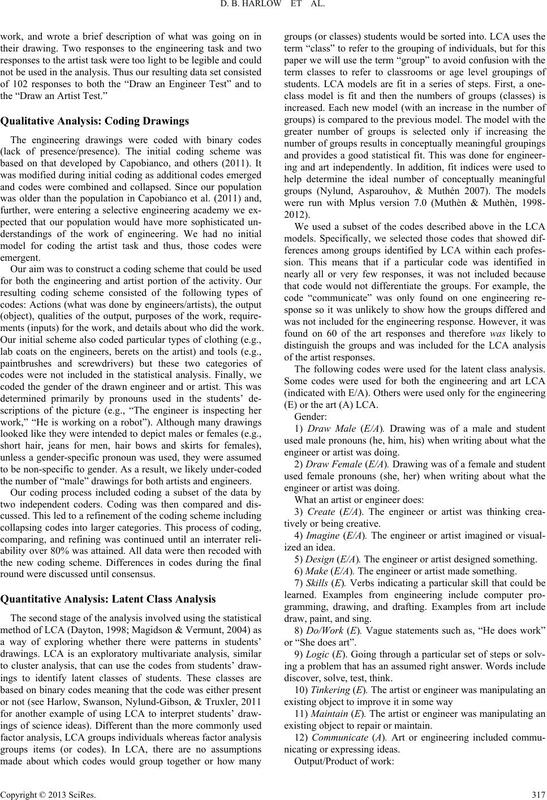 The following codes were used for the latent class analysis. (E) or the art (A) LCA. engineer or artist was doing. 5) Design (E/A). The engineer or artist designed something. 6) Make (E/A). The engineer or artist made something. existing object to repair or maintain. others’ enjoyment” and “to help others”. 15) Ideas (E). Students indicated that ideas were required. creativity (or the action of creating something) with engineering. work, construct, tinker, maintain, logic, knowledge, for others. Number of respo nses including each code. noted connections between the work of artists and engineers. appropriate number of group (classes), see Nylund et al. (2007). fit 1 through 4 groups, and for the art we fit 1 through 3 groups. Fit indices for the engineering and art drawings model solutions. probability (32%) of indicating that an engineer is creative. 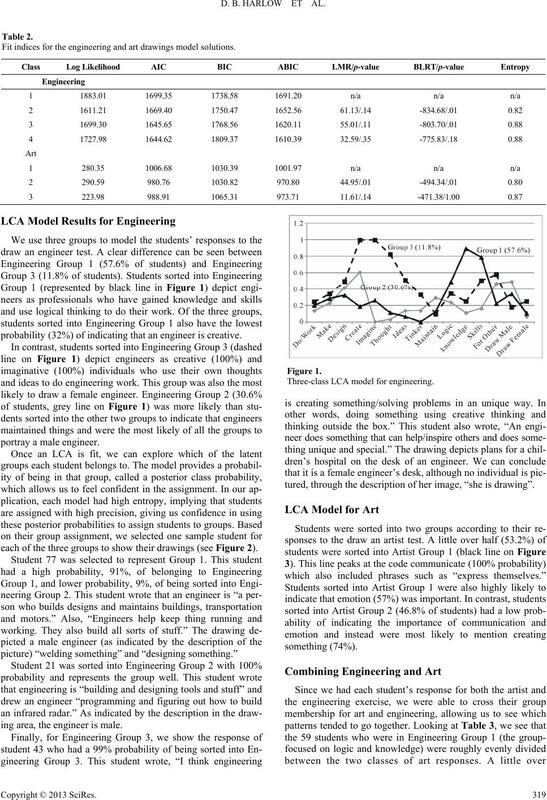 Three-class LCA model for engineering. tured, through the description of her image, “she is drawing”. 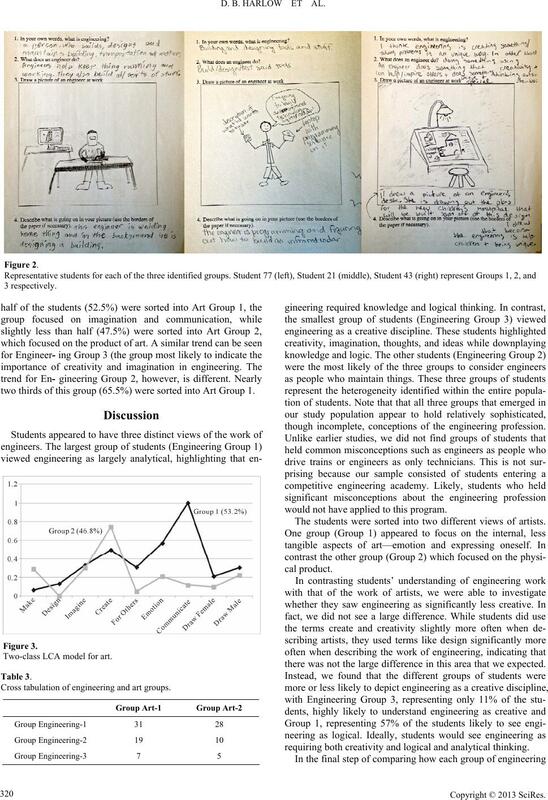 each of the three groups to show their drawings (see Figure 2). ing area, the engineer is male. two thirds of this group (65.5%) were sorted into Art Group 1. Two-class LCA model fo r art. 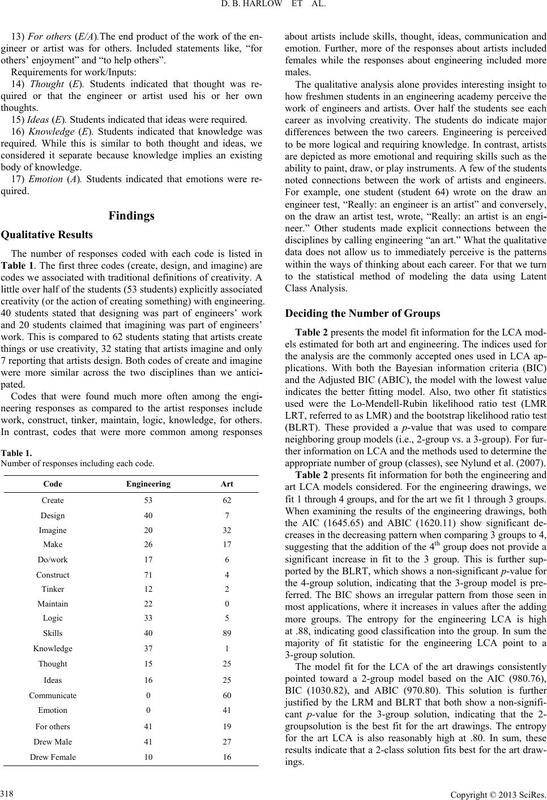 Cross tabulation of engi n e ering and art groups. 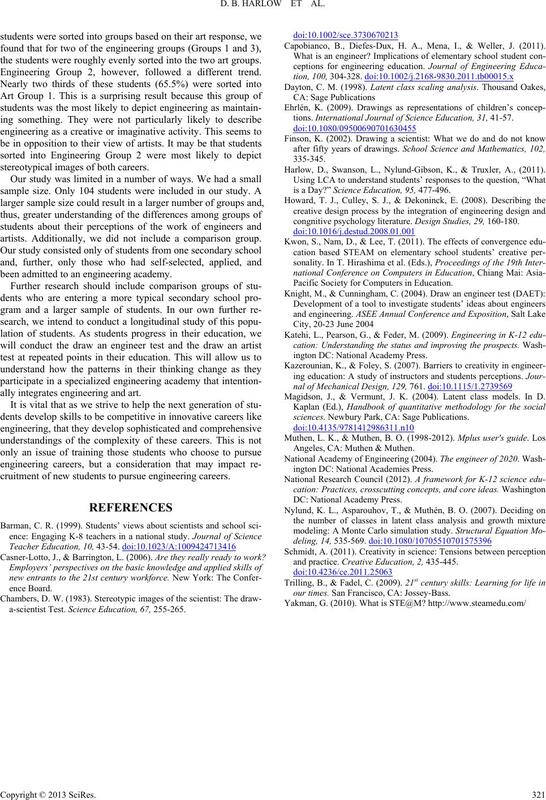 though incomplete, conceptions of the engineering profession. would not have applied to this program. The students were sorted into two different views of artists. there was not the large difference in this area that we expected. requiring both creativity and logical and analytical thinking. the students were roughly evenly sorted into the two art groups. Engineering Group 2, however, followed a different trend. stereotypical images of both careers. artists. Additionally, we did not include a comparison group. been admitted to an engineering acad emy. ally integrates engineering and art. cruitment of new students to pursue engineering careers. Casner-Lotto, J., & Barrington, L. (2006). Are they really ready to work? a-scientist Test. Science Education, 67, 255-265. Capobianco, B., Diefes-Dux, H. A., Mena, I., & Weller, J. (2011). tions. 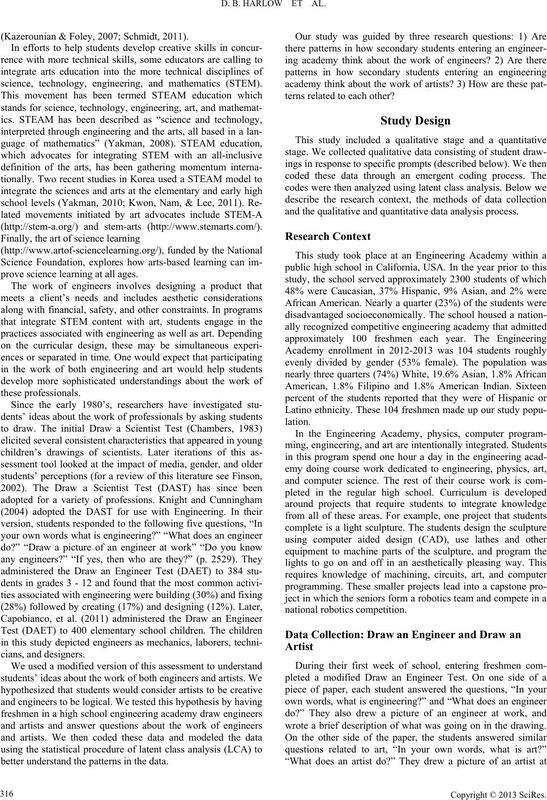 International Journal of Science Education, 31, 41-57. Harlow, D., Swanson, L., Nylund-Gibson, K., & Truxler, A., (2011). is a Day?” Science Education, 95, 477-496.
congnitive psychology literature. Design Studies, 29, 160-180. Pacific Society for Computers in Education. ington DC: National Academy Press. Magidson, J., & Vermunt, J. K. (2004). Latent class models. In D.
sciences. Newbury Park, CA: Sage Publication s .
Angeles, CA: Muthen & Muthen. ington DC: National Academies Press. and practice. Creative Education, 2, 435-445.
our times. San Francisco, CA: Jossey-Bass.